Vertu, the luxury phone brand Nokia last year sold to a private outfit EQT, has revealed its first Android-powered smartphone. 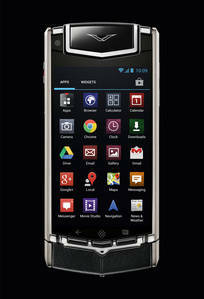 Vertu says the screen can survive a strike from a 110-gram ball bearing , or 50kgs of pressure. All of which sounds like just the ticket if you want a phone that has a chance of surviving when stepped on by a horse, an application to which the base price leather and steel model is probably better-suited than the golden variant. Reg readers operating in equine-free environments may also appreciate the Qualcomm Snapdragon S4, with two cores whizzing along at 1.7GHz, 64GB of internal memory, 8MP rear camera, 1080p video capabilities and 1.3MP front camera. There’s even baked-in NFC with tap-to-pay tech, for those who feel handling cash is a little gauche. Vertu’s site offers links to buy the phone online, but those links suggest would-be buyers “Contact a Boutique”. Your correspondent once beheld such an establishment, which also sold high-end-bling, within the bowels of a casino. Perhaps folks who frequent such venues are impressed by the statement Vertu has issued about the new phone, which describes it as “solid and beautifully crafted in the hand while offering unrivalled durability,” a quality we’re not entirely sure matters to those capable of spending so much on a phone. Perhaps the refined aesthetic of the phone, described as “distinctive Vertu design cues, such as the ceramic pillow and exposed watch screws, with a clean overall aesthetic, the result of which is a product that conveys a timeless elegance” are their buying cue? At €7,900 we imagine buyers hope there’s something timeless about the phone, which can also be had with alligator leather for €10,500, “Black PVD red gold mixed metals” for €16,500 or a “pure black” version at a mere €9,500.